A new study on the effectiveness of bicycle safety legislation in many states nationwide reveals that three foot passing laws are viewed by many as a "vital tool to increase bicycle safety." However, the study also laments difficulties involved in enforcement. 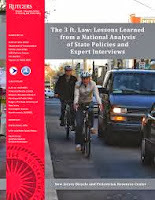 The study, The 3 ft. Law: Lessons Learned from a National Analysis of State Policies and Expert Interviews, was created by the Rutgers Edward J. Bloustein School of Planning and Public Policy. It offers a survey of the experiences of 20 states that have 3 foot passing laws in place, and considers the pros and cons of the laws with regard to its contribution to an increase in cycling safety. These laws mandate that drivers give cyclists on roadways at least 3 feet of space when passing. In the end, the study is short on data demonstrating the effectiveness of the laws in increasing cycling safety. It provides a lot of anecdotal "evidence" from bicycle advocates nationwide who tout the provisions as effective tools for educating the motoring public about the rights of cyclists. It also notes that the laws are part of a growing fabric of policy adding legitimacy to the bicycle as a practical transportation tool. On the other hand, the study gives a lot of space to the argument that the laws are unenforceable and of little real world consequence. Here is a link to the full study. The Rutgers team focuses on how the 3 foot passing statutes are used, and not used, by law enforcement nationwide. It notes that one jurisdiction briefly set up a sting to catch motorists violating bicyclists' space, but mostly describes police officers as generally unable to consistently enforce the laws. Sadly, the study completely neglects the role the 3 foot passing laws may pay in the civil justice context. For our firm, and others focused on representing injured cyclists, the laws are strong, sharp arrows in our quivers to use to go after drivers who harm cyclists. In negotiating with auto insurance carriers and their attorneys we routinely cite the 3 foot laws to demonstrate a driver's negligence. Just law week, I represented a client at an arbitration hearing in which I cited Illinois's 3 foot law. This particular arbitration hearing was, in essence, a mini-trial in which witnesses were called and interrogated and both sides' attorneys provided opening and closing statements. The case involved a female bicyclist who was struck by the front quarter panel of a vehicle whose driver passed too closely on Wells Street in Chicago's Loop, a notoriously narrow street with menacing pillars on both sides which support elevated train ("El") tracks. The defense argued that the cyclist was reckless for coming too close to the vehicle. However, citing the 3 foot passing law, I was able to effectively demonstrate that it was the driver who failed to give the cyclist the space she was entitled too under the law. The panel found the driver was principally negligent and provided an award in the cyclist's favor. (They found that the cyclist was, to a small extent, contributorily negligent, but that finding served only to minimally reduce the award, rather than to preclude it altogether.) It was a fair result. Bicycle advocates often focus only on the criminal side of law enforcement. In my experience, the the ability of the civil justice system to provide both compensation for the individual cyclist's harms and losses, and advocacy for cycling in general is too often overlooked by bicycling supports. I can only guess as to why. I fear that decades of negative media coverage about personal injury lawsuits have cast our civil justice system as merely a crass money making enterprise for greedy lawyers with ruby pinky rings. This caricature is unfair. The work we do can, and I believe does, have a positive broad effect. Suing someone for passing too closely to a cyclist and causing harm, or for dooring a cyclist, can have a wide social effect. Not only is the driver being sued likely to be more careful in the future, to the extent that driver spreads the word about his or her experience with the civil justice system, the people they know are put on notice to act more carefully around cyclists. I try to obey the three foot law but in heavy traffic I have to travel at the cyclist's speed until it is safe to pass. Then the cyclist runs red lights I got wait to pass the same cyclist over and over again. I and all the cars behind are therefore kept on the road longer. Many times I have been delayed by 10-15 minutes each day because of "green" commuters. Very useful you possess lots of understanding on this subject. Thanks for share..